When you first turn on your smartphone and you are taken through the setup process, you will undoubtedly be asked if you want to turn on location services. As you read the screen that talks about these location services, one that mentions GPS tracking, locations, and the accessing of information you may not want the world to know on a minute-by-minute basis, you may skip right over it, hoping to reconsider activating them later. And you know what, there is nothing wrong with that. But in case you do that, we figured you should probably know how to turn them back on, as many of the applications you use will be crippled if location services are not turned on. While it’s always scary to see an application ask to use your current location, you have to remember that in most cases, they are doing it to improve your smartphone or app experience. With your location information, apps like Google Maps can correctly pin-point your location to then help you find traffic information, see nearby places, and most importantly, navigate you from one location to another. Beyond Maps, think about apps like Foursquare, Instagram, and Facebook, all of which use your location to tag photos or check you in at your favorite restaurant. Without location services enabled, it would be difficult if not impossible for them to do this. 1. From your home screen, enter your Settings menu. *If running Jelly Bean, swipe your notification bar down, and tap the Settings icon. On a Samsung device, from your home screen you can tap Menu>Settings. 2. Scroll down to the “Personal” section. 3. Tap on “Location services” or “Location access” – whichever your phone shows. 4. From this screen, you can toggle on or off any of the location services your phone offers. 5. On most phones, that includes your carrier’s and Google’s location services, plus standalone GPS services. 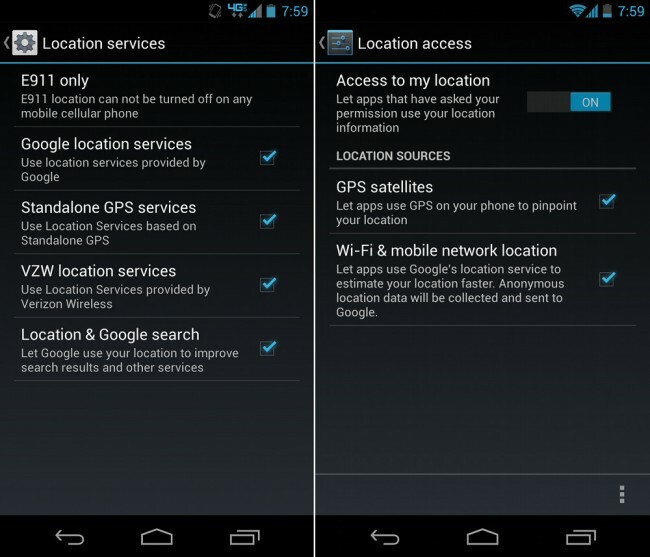 Carrier location services: When checked, it uses your carrier’s cell towers to help to pin-point your location. A number of people leave this option unchecked, though just as many if not more leave it checked. 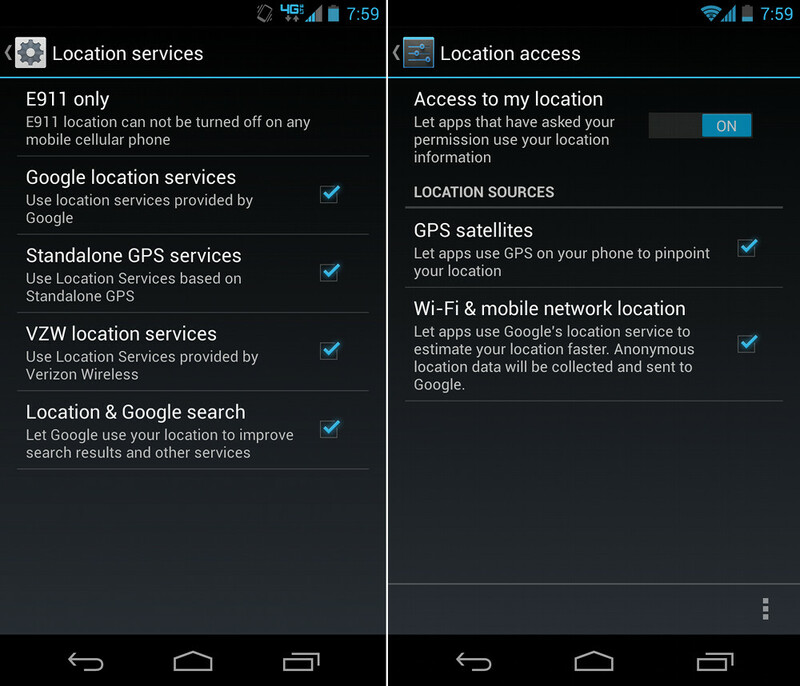 Google location services: This mostly uses WiFi signals to help determine your location. No need to turn these off. Standalone GPS services: This uses the GPS unit in your phone in order to determine your location. There has long been talk of location services draining the battery of phones. As they are, at times, constantly looking for your location, that is somewhat true. However, as times have changed and technology has evolved, leaving location services on does less and less to decrease the life of your battery. Toggling on or off your location services now has more to do with privacy than anything.